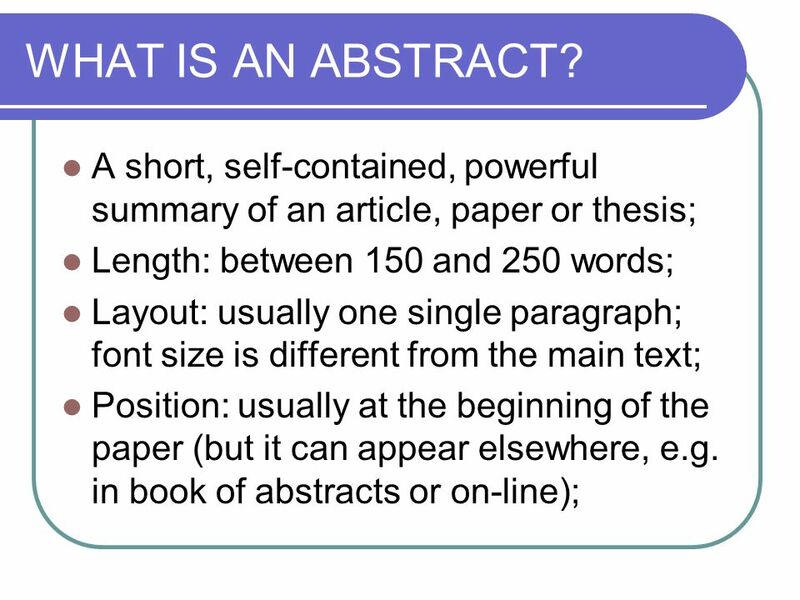 An abstract is an original document, not a collection of quotations taken from the text it summarizes, i.e. it must be able to stand alone. 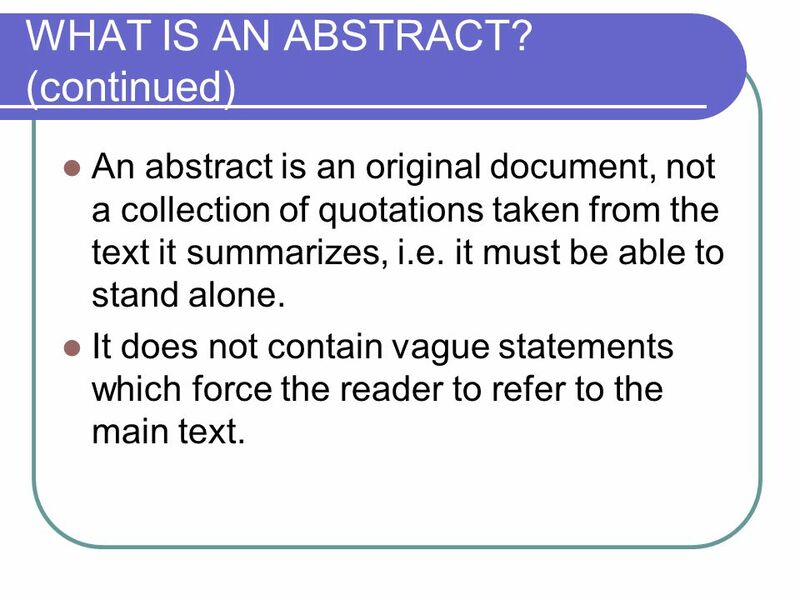 It does not contain vague statements which force the reader to refer to the main text. 5 WHO WRITES IT? 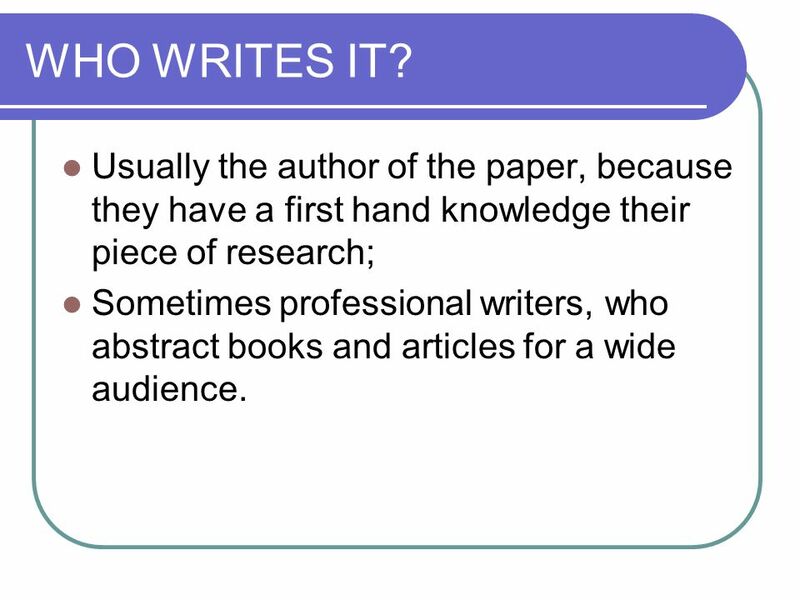 Usually the author of the paper, because they have a first hand knowledge their piece of research; Sometimes professional writers, who abstract books and articles for a wide audience. 7 WHO READS IT? Same-field professionals (e.g. 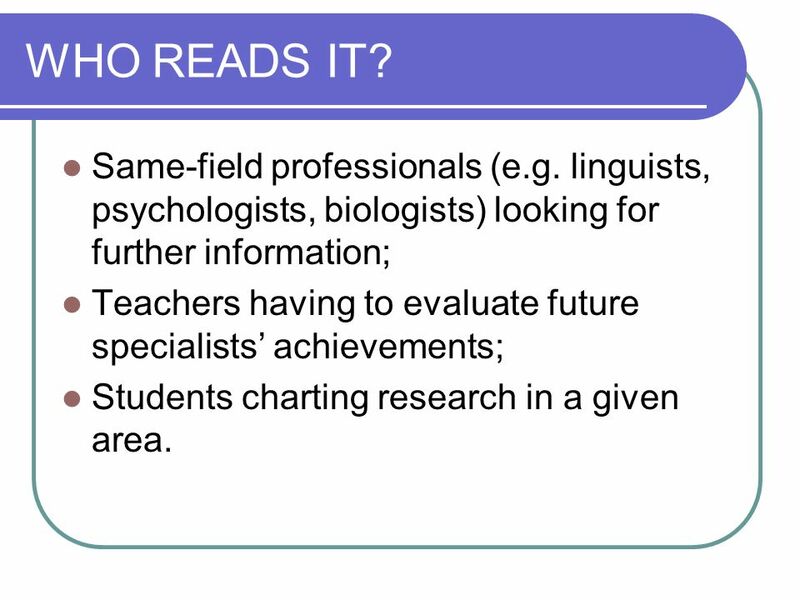 linguists, psychologists, biologists) looking for further information; Teachers having to evaluate future specialists’ achievements; Students charting research in a given area. 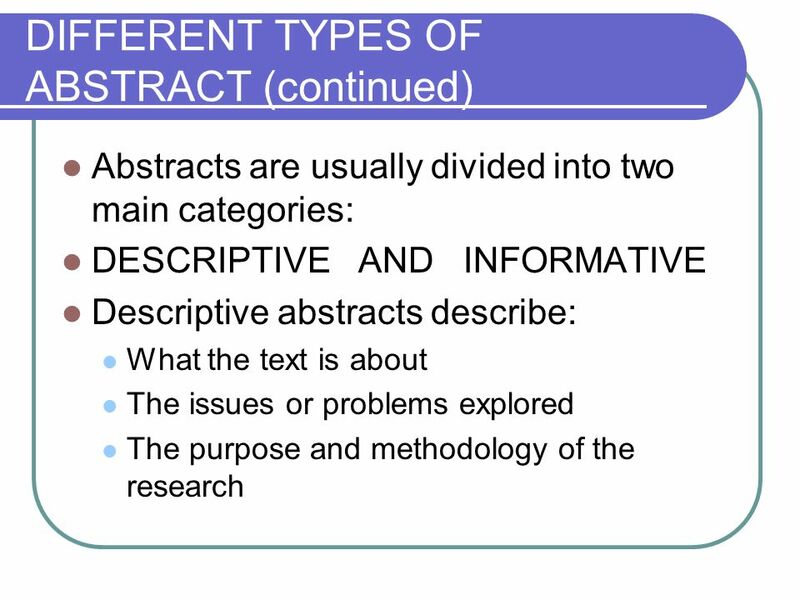 Abstracts are genre-sensitive (i.e. 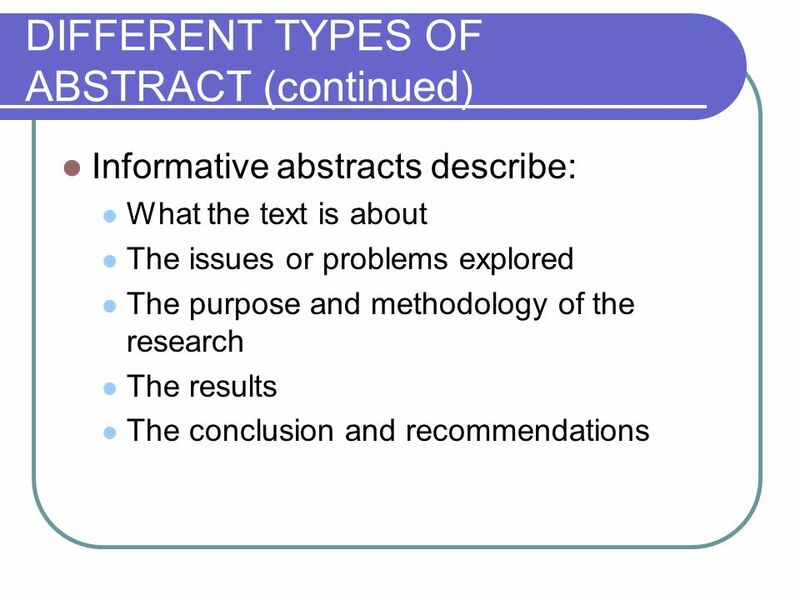 components vary according to discipline) an abstract of a social science or scientific work may contain the scope, purpose, results, and contents of the work. 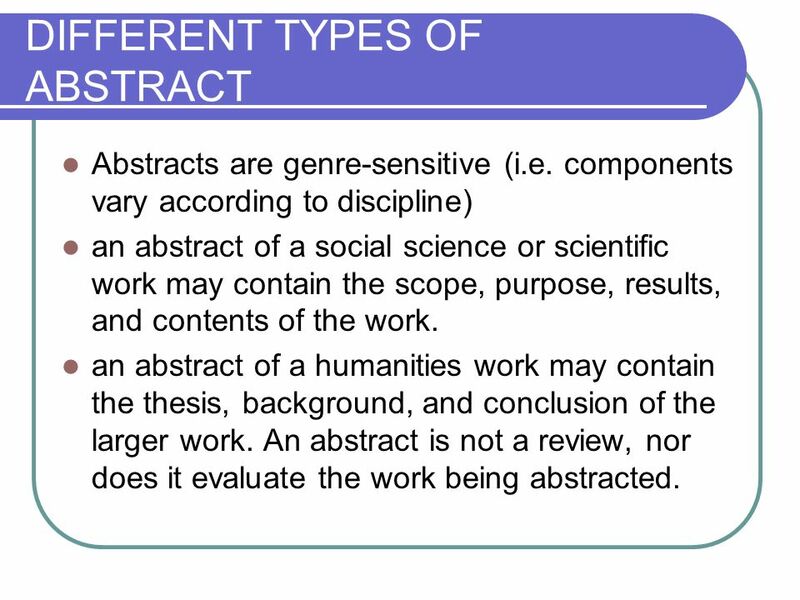 an abstract of a humanities work may contain the thesis, background, and conclusion of the larger work. 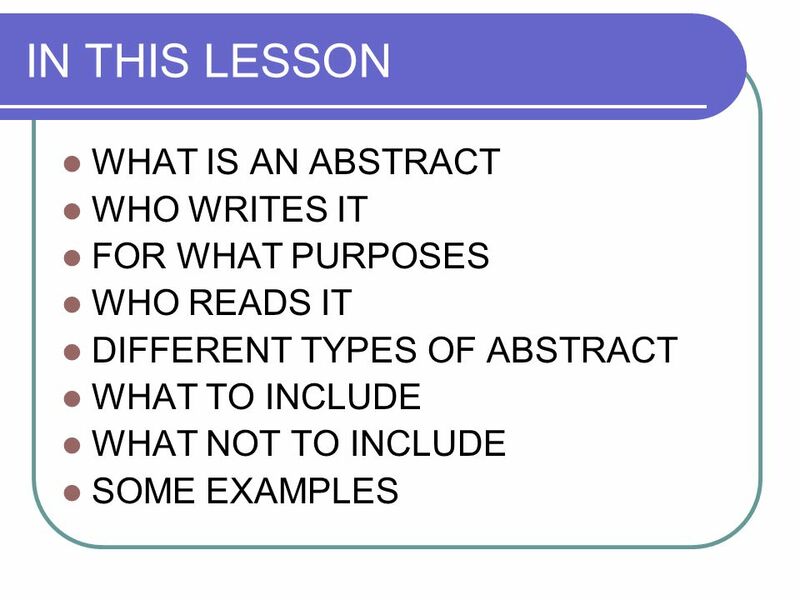 An abstract is not a review, nor does it evaluate the work being abstracted. 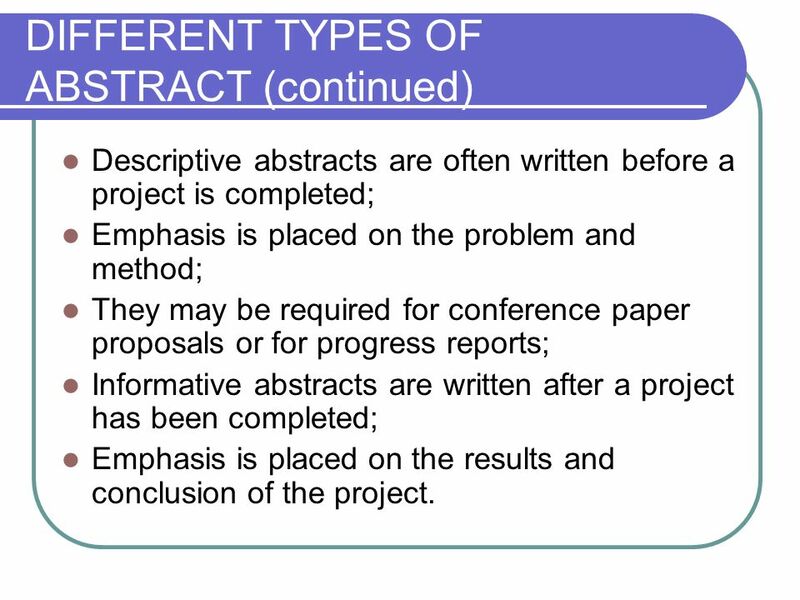 Descriptive abstracts are often written before a project is completed; Emphasis is placed on the problem and method; They may be required for conference paper proposals or for progress reports; Informative abstracts are written after a project has been completed; Emphasis is placed on the results and conclusion of the project. 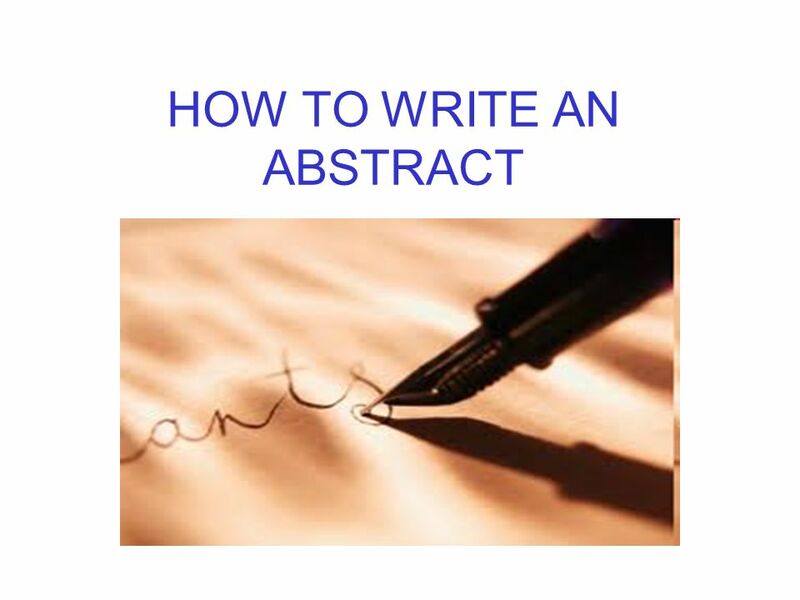 The format of your abstract will depend on the work being abstracted; An abstract of a scientific research paper will contain elements not found in an abstract of a literature article, and vice versa; However, all abstracts share several mandatory components. 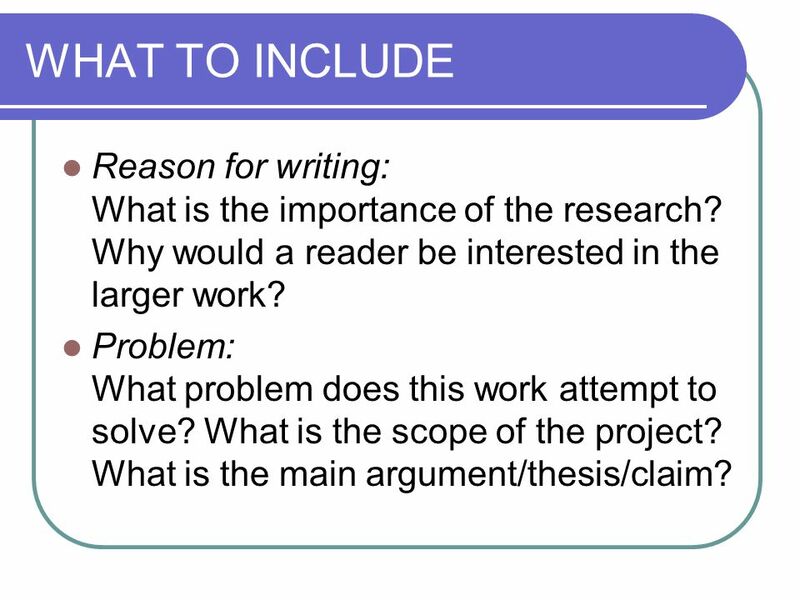 13 WHAT TO INCLUDE Reason for writing: What is the importance of the research? Why would a reader be interested in the larger work? Problem: What problem does this work attempt to solve? What is the scope of the project? What is the main argument/thesis/claim? 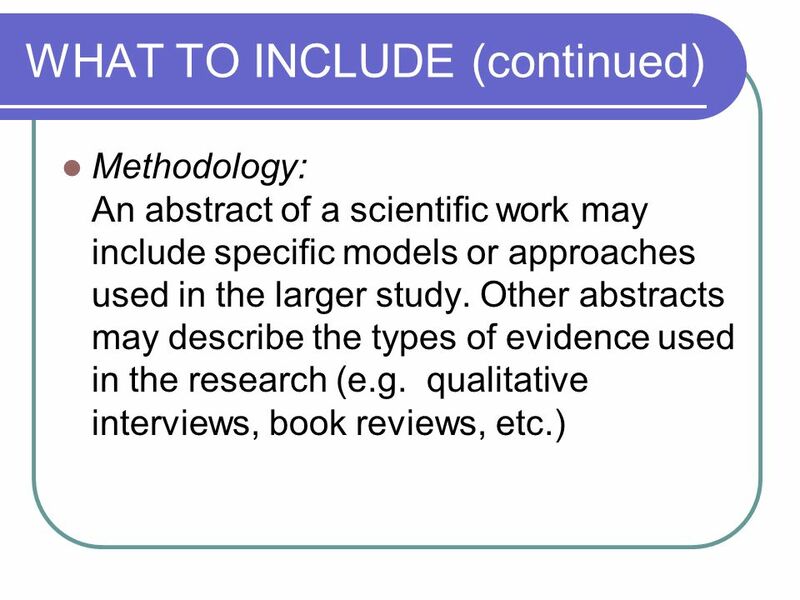 Results: Again, an abstract of a scientific work may include specific data that indicates the results of the project. 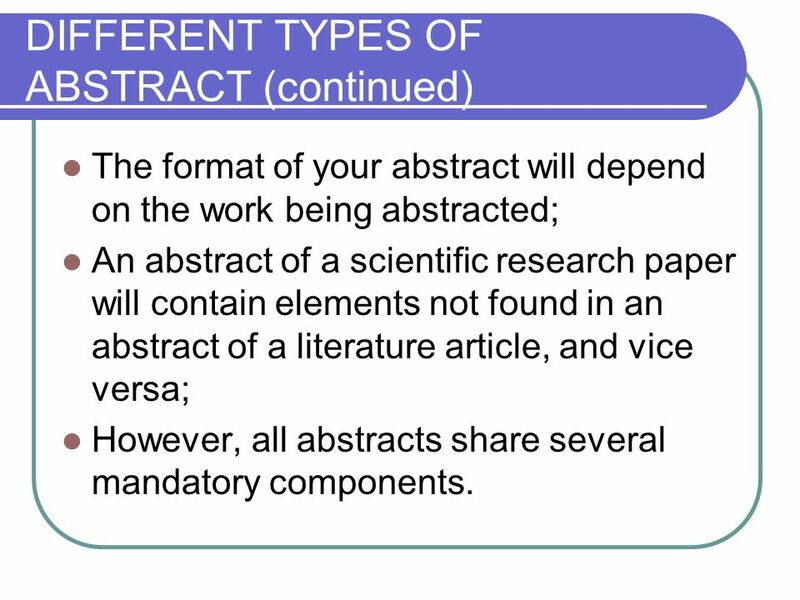 Other abstracts may discuss the findings in a more general way. 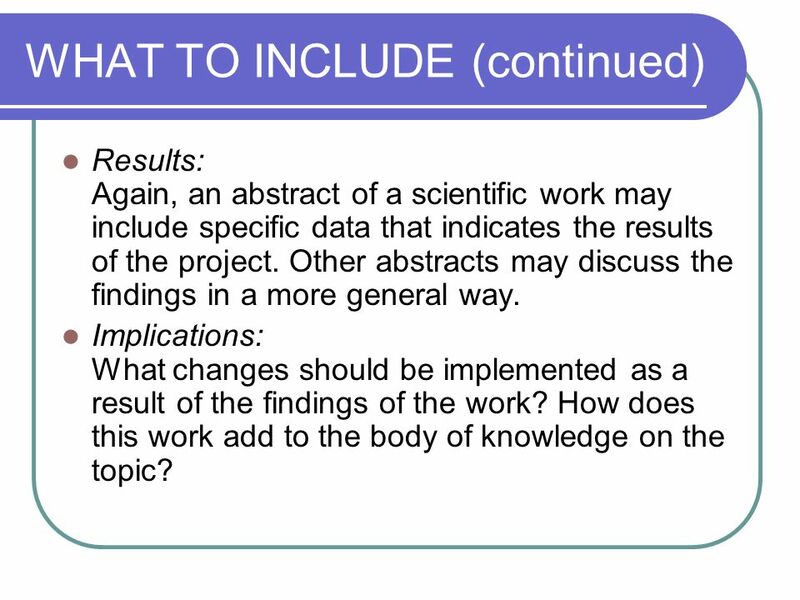 Implications: What changes should be implemented as a result of the findings of the work? How does this work add to the body of knowledge on the topic? 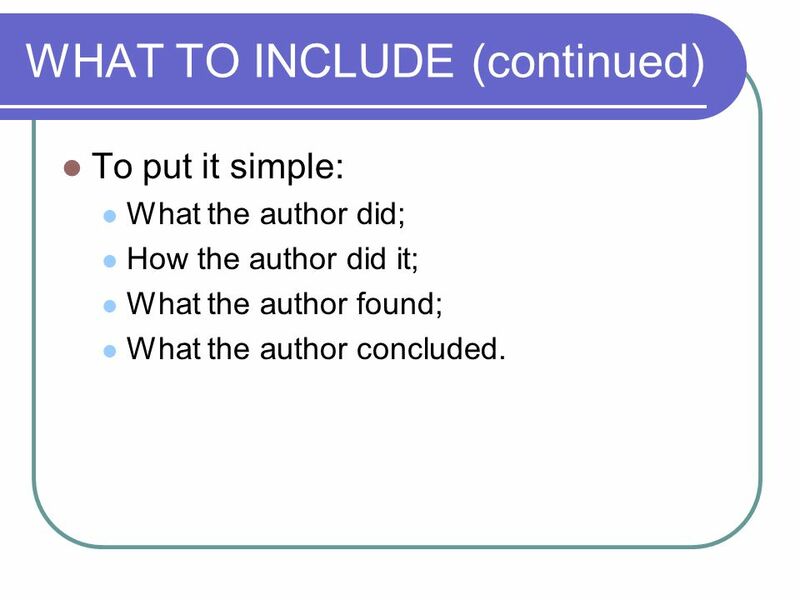 To put it simple: What the author did; How the author did it; What the author found; What the author concluded. 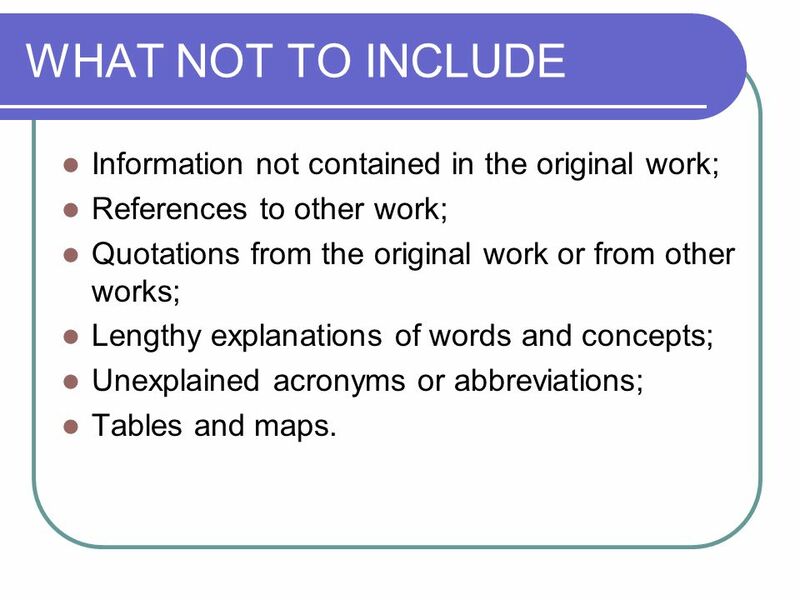 References to other work; Quotations from the original work or from other works; Lengthy explanations of words and concepts; Unexplained acronyms or abbreviations; Tables and maps. 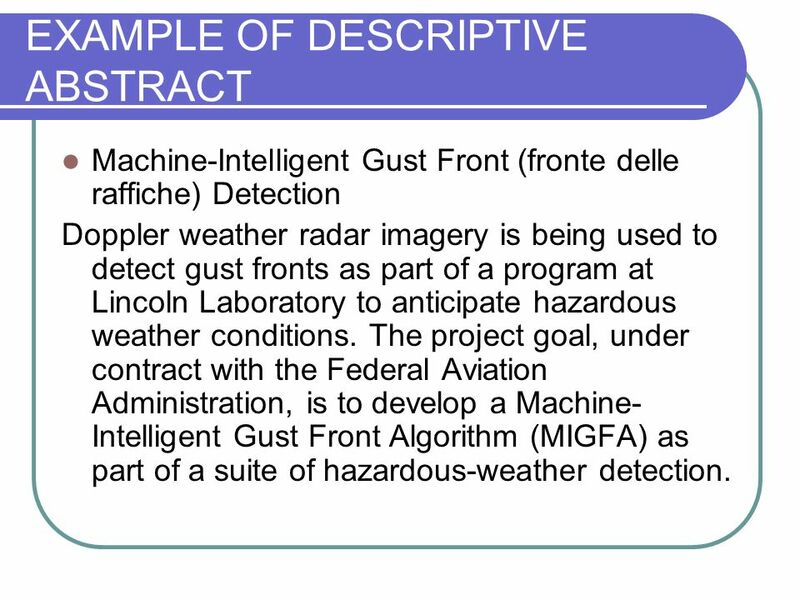 Machine-Intelligent Gust Front (fronte delle raffiche) Detection Doppler weather radar imagery is being used to detect gust fronts as part of a program at Lincoln Laboratory to anticipate hazardous weather conditions. The project goal, under contract with the Federal Aviation Administration, is to develop a Machine-Intelligent Gust Front Algorithm (MIGFA) as part of a suite of hazardous-weather detection. Machine-Intelligent Gust Front Detection Techniques of low-level machine intelligence, originally developed at Lincoln Laboratory to recognize ground vehicles obscured by camouflage and foliage, are being used to detect gust fronts in Doppler weather radar imagery. 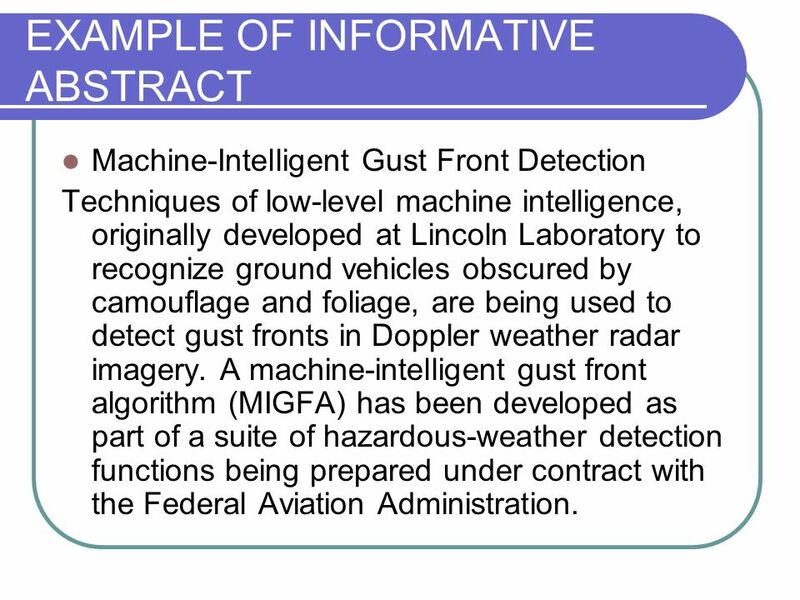 A machine-intelligent gust front algorithm (MIGFA) has been developed as part of a suite of hazardous-weather detection functions being prepared under contract with the Federal Aviation Administration. 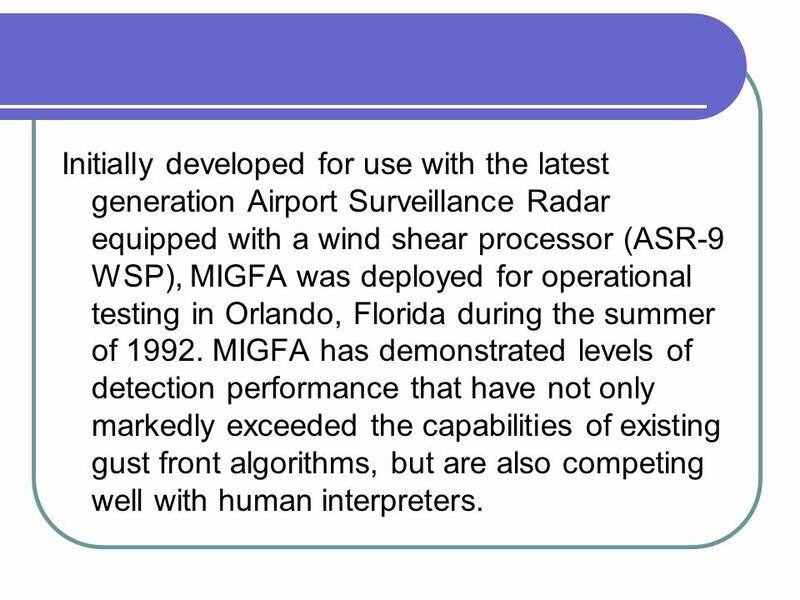 20 Initially developed for use with the latest generation Airport Surveillance Radar equipped with a wind shear processor (ASR-9 WSP), MIGFA was deployed for operational testing in Orlando, Florida during the summer of MIGFA has demonstrated levels of detection performance that have not only markedly exceeded the capabilities of existing gust front algorithms, but are also competing well with human interpreters. 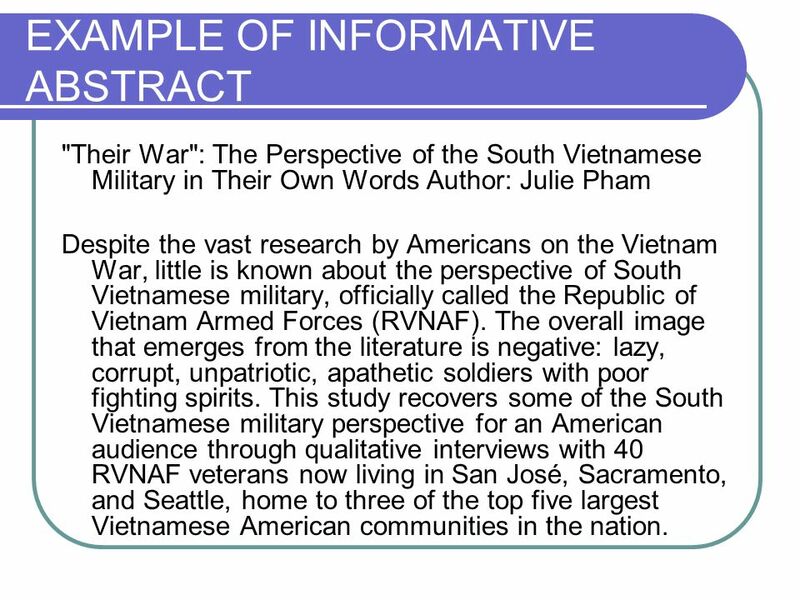 "Their War": The Perspective of the South Vietnamese Military in Their Own Words Author: Julie Pham Despite the vast research by Americans on the Vietnam War, little is known about the perspective of South Vietnamese military, officially called the Republic of Vietnam Armed Forces (RVNAF). The overall image that emerges from the literature is negative: lazy, corrupt, unpatriotic, apathetic soldiers with poor fighting spirits. 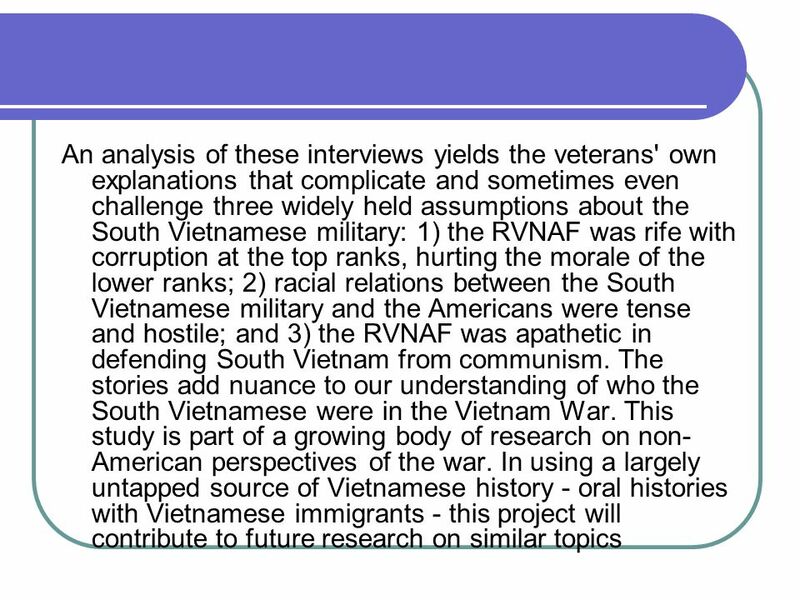 This study recovers some of the South Vietnamese military perspective for an American audience through qualitative interviews with 40 RVNAF veterans now living in San José, Sacramento, and Seattle, home to three of the top five largest Vietnamese American communities in the nation. 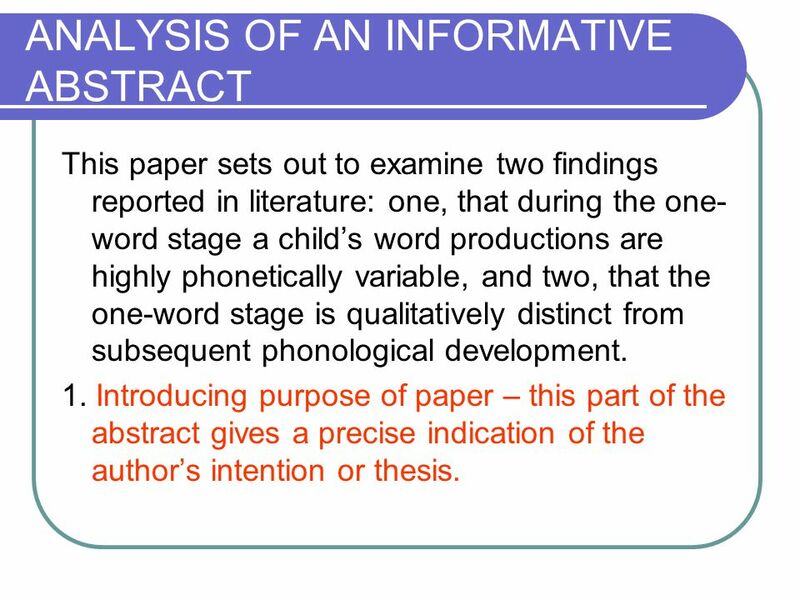 This paper sets out to examine two findings reported in literature: one, that during the one-word stage a child’s word productions are highly phonetically variable, and two, that the one-word stage is qualitatively distinct from subsequent phonological development. 1. 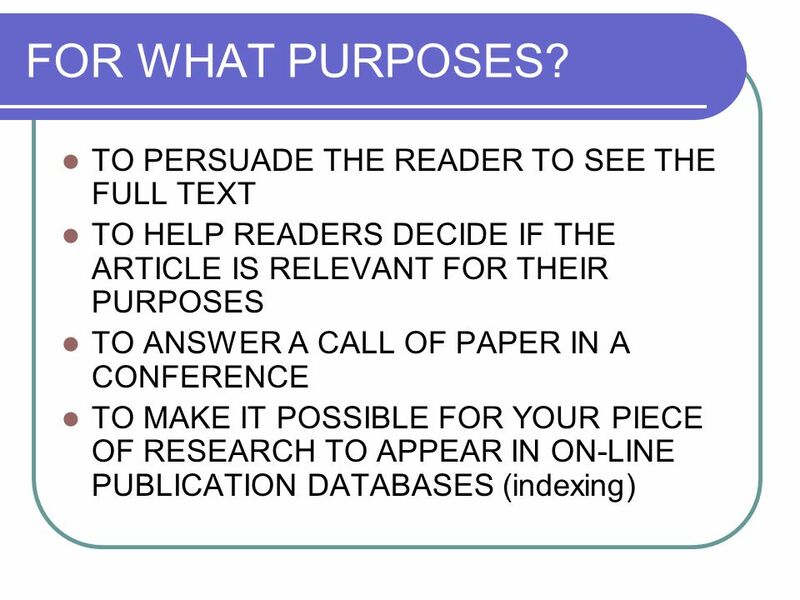 Introducing purpose of paper – this part of the abstract gives a precise indication of the author’s intention or thesis. 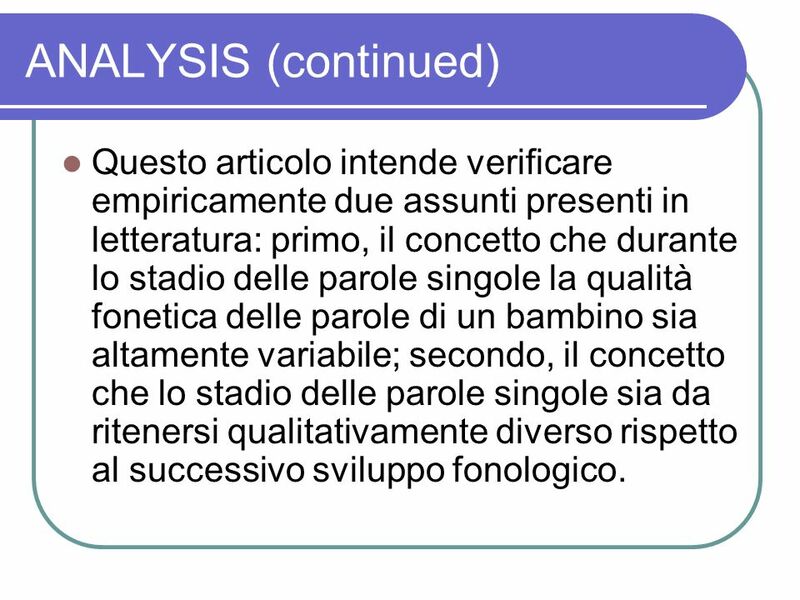 24 ANALYSIS (continued) Questo articolo intende verificare empiricamente due assunti presenti in letteratura: primo, il concetto che durante lo stadio delle parole singole la qualità fonetica delle parole di un bambino sia altamente variabile; secondo, il concetto che lo stadio delle parole singole sia da ritenersi qualitativamente diverso rispetto al successivo sviluppo fonologico. 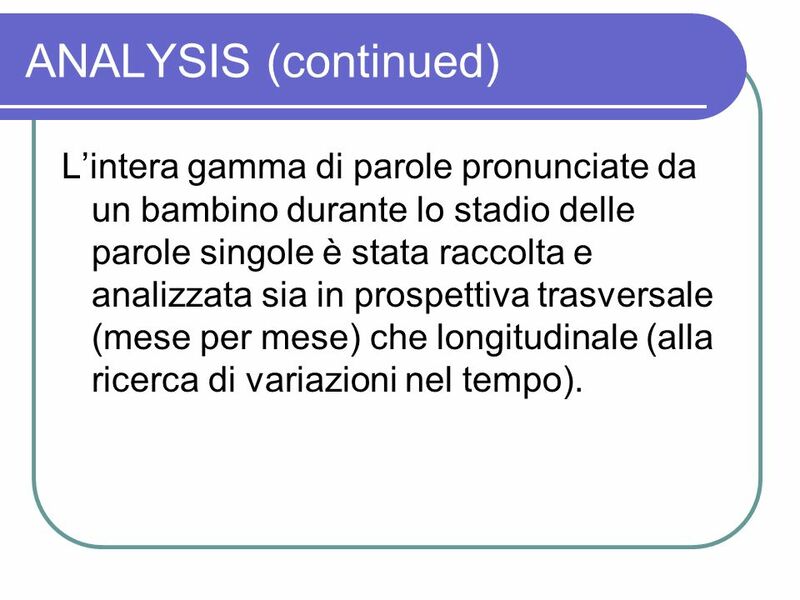 26 ANALYSIS (continued) L’intera gamma di parole pronunciate da un bambino durante lo stadio delle parole singole è stata raccolta e analizzata sia in prospettiva trasversale (mese per mese) che longitudinale (alla ricerca di variazioni nel tempo). 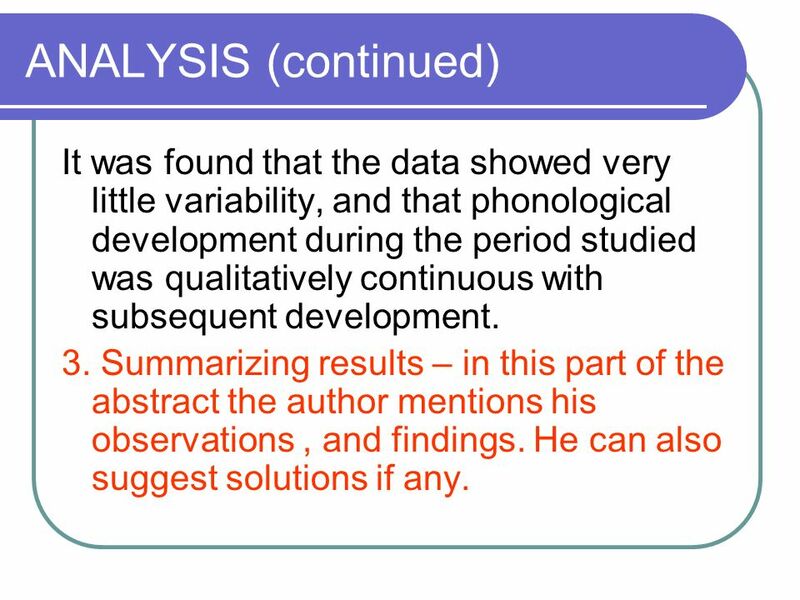 27 ANALYSIS (continued) It was found that the data showed very little variability, and that phonological development during the period studied was qualitatively continuous with subsequent development. 3. 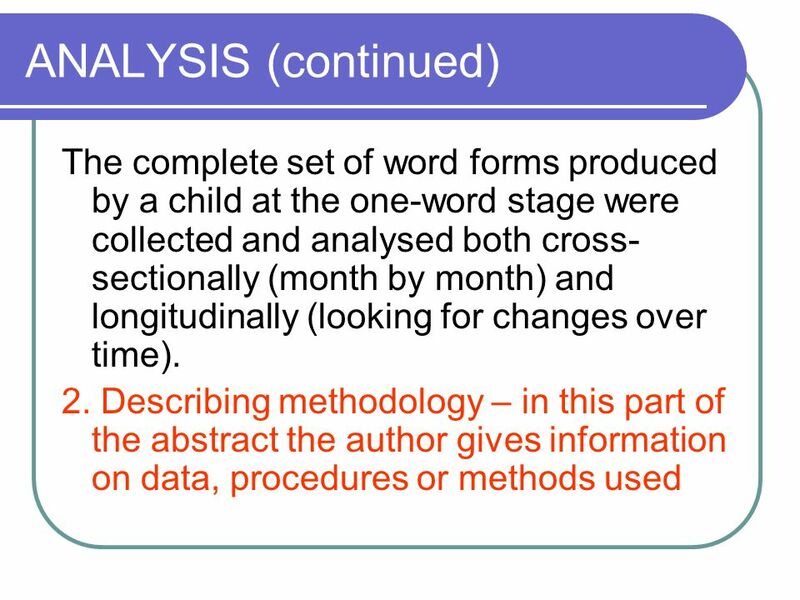 Summarizing results – in this part of the abstract the author mentions his observations , and findings. He can also suggest solutions if any. 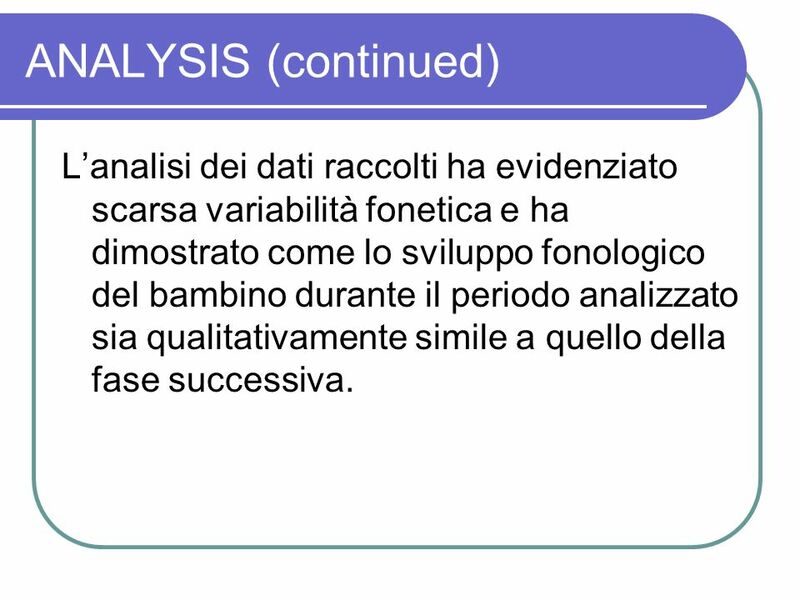 28 ANALYSIS (continued) L’analisi dei dati raccolti ha evidenziato scarsa variabilità fonetica e ha dimostrato come lo sviluppo fonologico del bambino durante il periodo analizzato sia qualitativamente simile a quello della fase successiva. 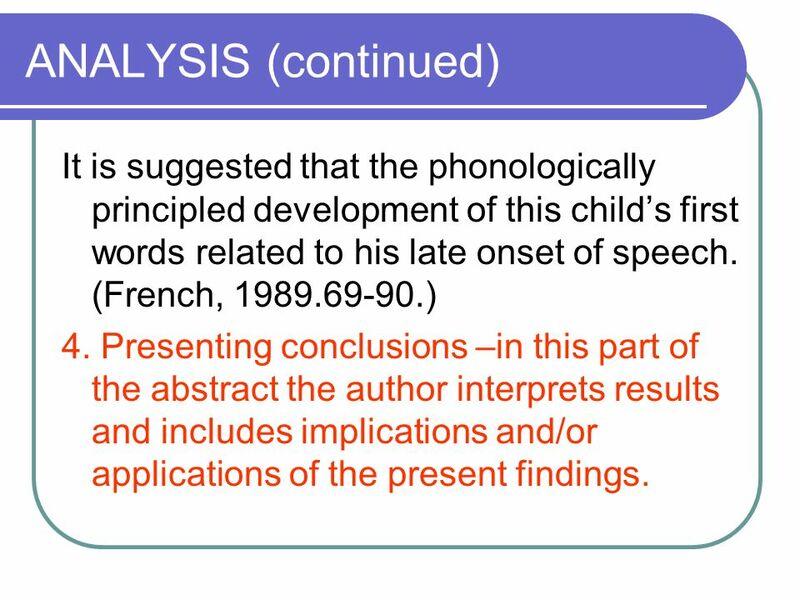 29 ANALYSIS (continued) It is suggested that the phonologically principled development of this child’s first words related to his late onset of speech. (French, ) 4. 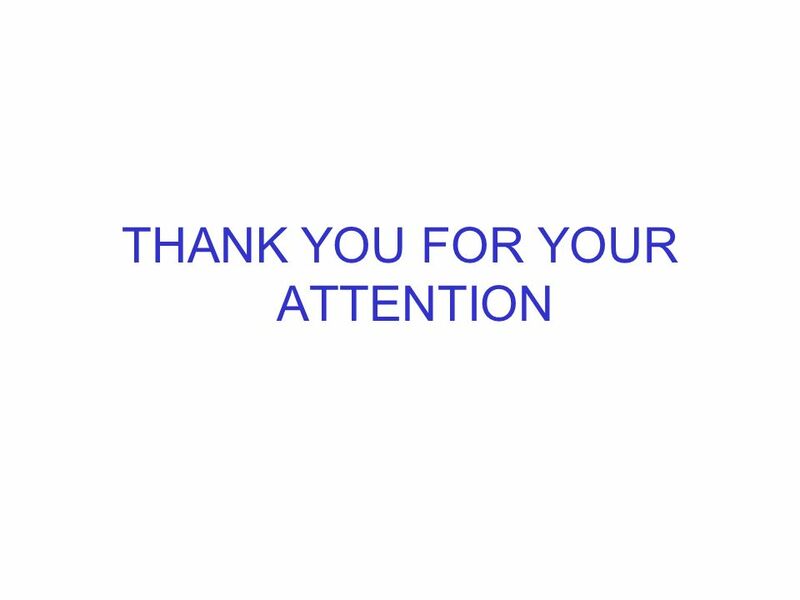 Presenting conclusions –in this part of the abstract the author interprets results and includes implications and/or applications of the present findings. 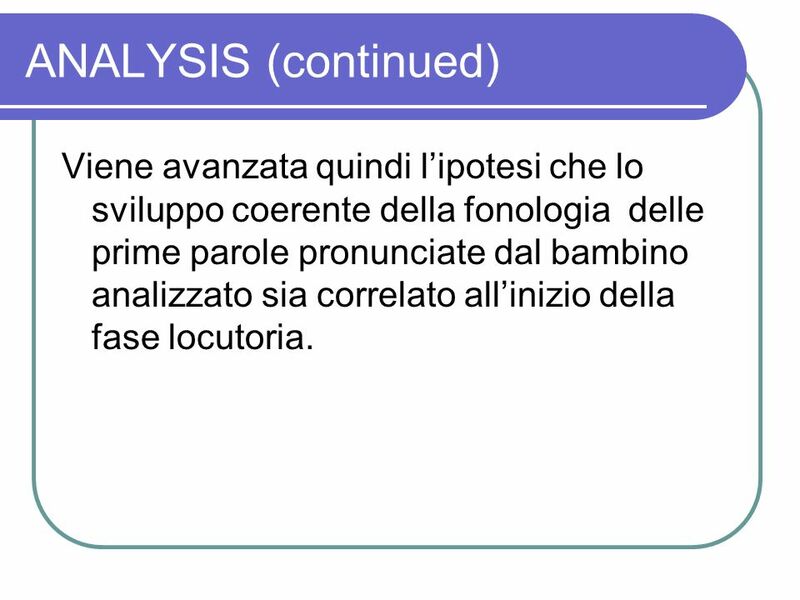 30 ANALYSIS (continued) Viene avanzata quindi l’ipotesi che lo sviluppo coerente della fonologia delle prime parole pronunciate dal bambino analizzato sia correlato all’inizio della fase locutoria. 32 Da un’alta percentuale di gruppi nominali premodificati (68%), mentre I ‘travelogues’ prediligono la postmodificazione (58%). 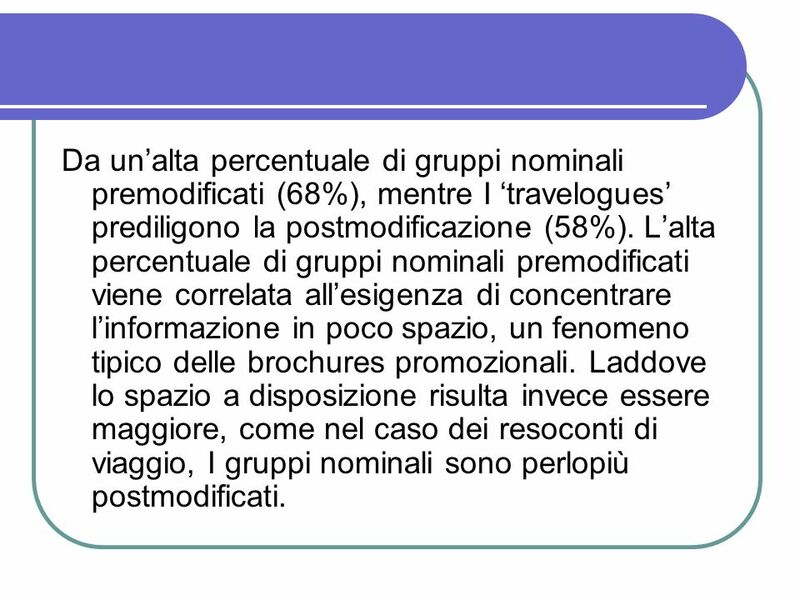 L’alta percentuale di gruppi nominali premodificati viene correlata all’esigenza di concentrare l’informazione in poco spazio, un fenomeno tipico delle brochures promozionali. Laddove lo spazio a disposizione risulta invece essere maggiore, come nel caso dei resoconti di viaggio, I gruppi nominali sono perlopiù postmodificati. 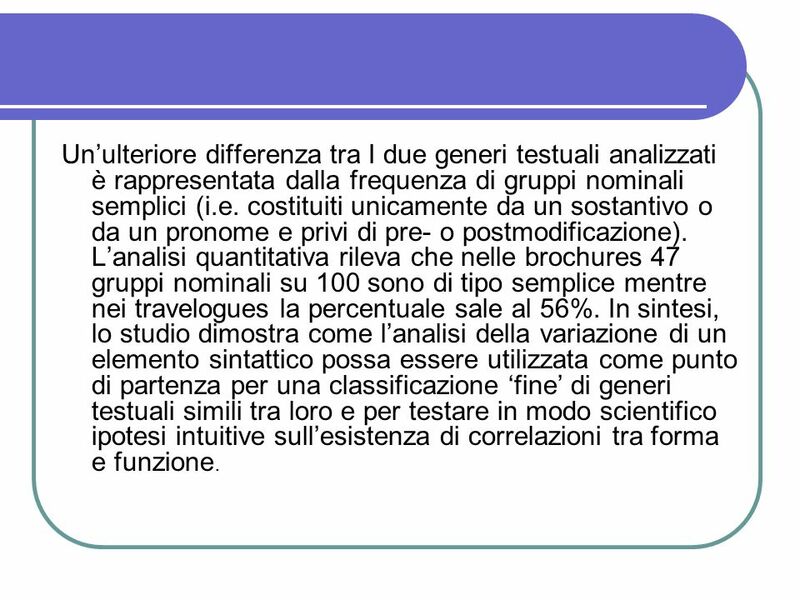 33 Un’ulteriore differenza tra I due generi testuali analizzati è rappresentata dalla frequenza di gruppi nominali semplici (i.e. costituiti unicamente da un sostantivo o da un pronome e privi di pre- o postmodificazione). 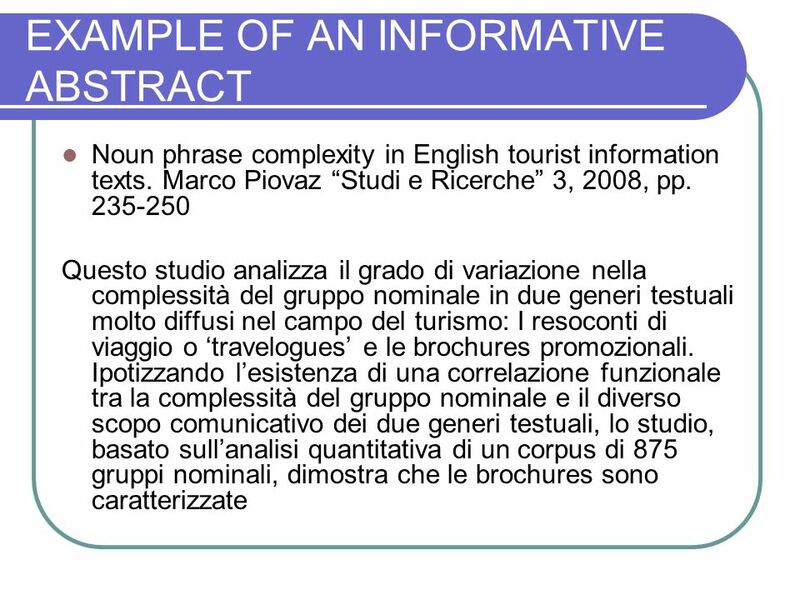 L’analisi quantitativa rileva che nelle brochures 47 gruppi nominali su 100 sono di tipo semplice mentre nei travelogues la percentuale sale al 56%. In sintesi, lo studio dimostra come l’analisi della variazione di un elemento sintattico possa essere utilizzata come punto di partenza per una classificazione ‘fine’ di generi testuali simili tra loro e per testare in modo scientifico ipotesi intuitive sull’esistenza di correlazioni tra forma e funzione. 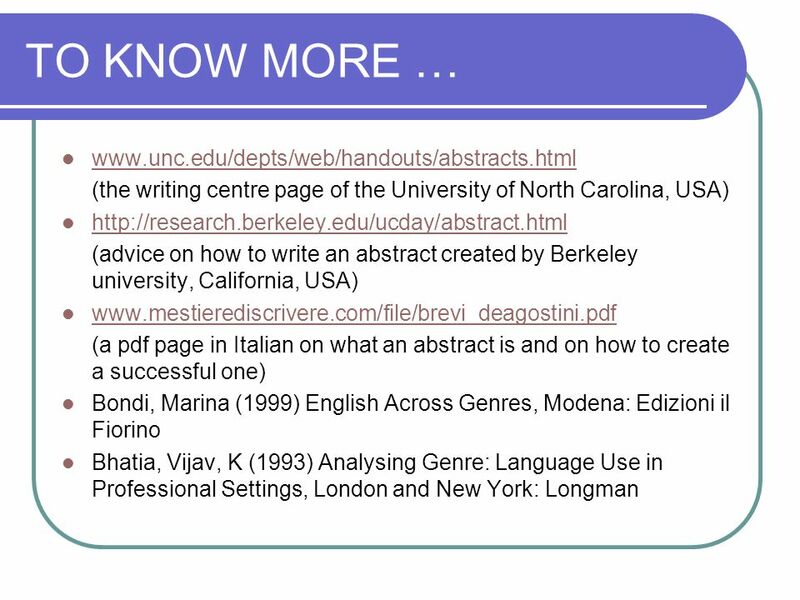 Scaricare ppt "HOW TO WRITE AN ABSTRACT"